Record executive Jerry Bradley, artist and comedian Ray Stevens, and duo Brooks & Dunn are the latest inductees into the Country Music Hall of Fame, it was announced Monday morning (March 18). CMA CEO Sarah Trahern welcomed the crowd gathered at Country Music Hall of Fame and Museum in downtown Nashville. The Country Music Hall of Fame was created in 1961 to honor those artists and musicians who made an indelible mark on country music, and 136 legends are in their ranks. Host Reba McEntire fell ill and could not be in attendance to host the event. In her stead, Bill Cody hosted the morning’s announcement. 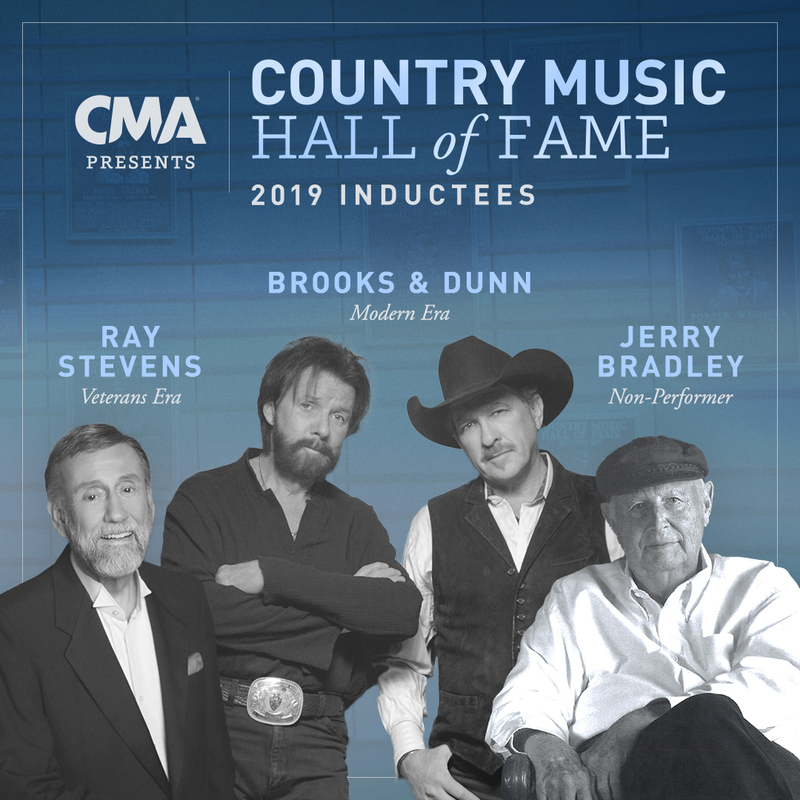 Brooks & Dunn were named for the Modern Era category, while Stevens was selected in the Veteran Era artist and Jerry Bradley accepted the honor in the non-performer category (which rotates every three years). “This means so much to us and I will be honored to accept it, but I still don’t think I’m ever gonna be able to believe it!” added Ronnie Dunn. Bradley belongs to one of the greatest dynasties of the Nashville music industry. His father was Country Music Hall of Fame member Owen Bradley. Bradley’s uncle was Country Music Hall of Fame member Harold Bradley, a member of the fabled “A-Team” of session musicians and believed to be the most recorded guitarist in history. Bradley’s uncle Charlie and cousin Bobby Bradley are noted recording-studio engineers. His aunt was the pioneering female Music Row office manager Ruby Bradley Strange. Bradley’s sister is retired BMI executive Patsy Bradley. His wife Connie Bradley was the chief of ASCAP’s Music City office from 1980 to 2010. His son is artist manager Clay Bradley. Born in 1940, Bradley was educated in Nashville and served in the Army from 1960 to 1962. Following his discharge, Jerry told his father he’d like to join him in the music business. Owen taught him audio engineering skills at Bradley’s Barn studio beginning in 1965. With his uncle Harold, Jerry launched the family’s Forrest Hills Music publishing company. But Bradley was keen to establish his own Music Row identity. In 1970, he became the assistant to legendary RCA chief, producer and guitarist Chet Atkins, another member of the Country Music Hall of Fame. Bradley assumed the label’s administrative and business tasks so that Atkins could concentrate on music. He arrived at the company just as Atkins protégée Reed achieved the pop-crossover hits “Amos Moses” (1970) and “When You’re Hot, You’re Hot” (1971). In 1973, Bradley became the head of RCA’s Nashville operation. Under his leadership, the label became one of the first in Nashville to achieve autonomy from New York. This meant that he and his successors were free to sign artists, design album graphics and create marketing materials without oversight. He gradually replaced RCA’s “old guard” record producers with new talents such as Tom Collins, Harold Shedd and Norro Wilson. He helped tutor his RCA successor, Joe Galante, teaching the younger executive to appreciate country music. He signed Milsap in 1973 and remained at the helm of RCA, just as he crossed over to the pop charts with “It Was Almost Like a Song” (1977) and “(There’s) No Gettin’ Over Me” (1981). Parton had ambitions beyond country music. Bradley helped her achieve these with “Here You Come Again” (1977) and “9 to 5” (1980). Thanks to Bradley’s RCA team, Presley returned to the country spotlight in the mid-1970s with “I’ve Got a Thing About You Baby,” “Help Me,” “T-R-O-U-B-L-E” and more. Bradley had begun producing records in the early 1970s. His initial successes included hits with Nat Stuckey (1971’s “She Wakes Me With a Kiss Every Morning”) and Johnny Russell (1973’s “Rednecks, White Socks and Blue Ribbon Beer”). In 1973, he began producing Pride. They had more than a dozen No. 1 records together, including “Someone Loves You Honey” (1978) and “Mississippi Cotton Picking Delta Town” (1974). He signed Alabama to RCA in 1980 and launched the act’s historic string of hits. The label’s promotion of such No. 1 smashes as 1980-81’s “Tennessee River,” “Feels So Right” and “Why Lady Why” led to Alabama’s superstardom, Country Music Hall of Fame induction, and more than 75 million in sales. While at RCA, Bradley also presided over star-making hits by such artists as Dave & Sugar, John Denver, and Sylvia. During his 1986-2002 spell at the Opryland Music Group, Bradley produced Pride’s “Shouldn’t It Be Easier Than This” (1987), “I’m Gonna Love Her on the Radio” (1988) and more. He also signed such artists as John Conlee and Neal McCoy. Jerry and Connie Bradley are now retired and remain beloved figures in the Nashville music community. 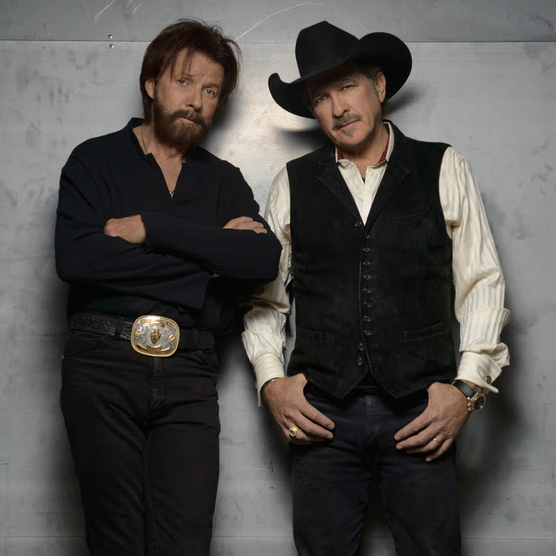 For Brooks & Dunn, the road to the Country Music Hall of Fame has been paved with unparalleled accomplishments. The duo dominated the country popularity charts for two decades with 60 charted singles, more than 40 Top 10 hits, 20 No. 1 triumphs, and 12 Platinum-plus albums. Named CMA Entertainer of the Year in 1996, Brooks & Dunn are the most awarded CMA duo of all time. They have created such timeless musical moments as “Neon Moon,” “Believe,” “Boot Scootin’ Boogie,” “Play Something Country” and “Rock My World (Little Country Girl).” Their concert prowess set a new bar of entertainment in country music. In fact, their achievements transcend the country genre. By any measure, Brooks & Dunn are one of the most successful musical duos in American music history. Meanwhile, Ronnie Dunn was becoming a regional honky-tonk star in Texas and Oklahoma. Born in Texas in 1953, he originally performed in his father’s country band. He was a gospel artist while attending college in Abilene. His performances in Tulsa nightclubs led music mogul Jim Halsey to sign him to his Churchill label in 1981. Dunn first appeared on the charts in 1983 with “It’s Written All Over Your Face” and, the next year, “She Put the Sad in All His Songs.” Although he wrote neither song, he was blossoming as a songwriter at the time with “Boot Scootin’ Boogie,” among other compositions. He won the Marlboro Country Talent Search in 1988. This eventually led him to the doorstep of Arista Records. The label was already a pop powerhouse. In 1990, it was opening a country music division with DuBois at the helm. He knew both Dunn and Brooks and suggested that they write songs together. Meanwhile, Asleep at the Wheel recorded Dunn’s “Boot Scootin’ Boogie” for their 1990 Arista album Keepin’ Me Up Nights. When Dunn and Brooks came up with “Brand New Man” (with collaborator Don Cook), DuBois urged them to join forces as an Arista act. Although each had solo aspirations and didn’t know one another well, they agreed to become a team. Brooks & Dunn became overnight stars with the 1991 release of “Brand New Man” and “My Next Broken Heart.” Dunn’s searing performance of his self-written “Neon Moon” cemented the new act’s stardom in 1992. The duo’s recording of “Boot Scootin’ Boogie” became a country dance club sensation. The team earned the first of 14 CMA Vocal Duo of the Year awards that fall. Also, in 1992, McBride & the Ride revived Brooks’ “Sacred Ground” and took it to the top of the country charts. The following year, Brooks & Dunn won their first Grammy with “Hard Workin’ Man.” “She Used to Be Mine” hit No. 1 in 1993. “Rock My World (Little Country Girl),” “That Ain’t No Way to Go” and “She’s Not the Cheatin’ Kind” continued the duo’s hit streak in 1994. By the mid-1990s, Brooks & Dunn were renowned for high-energy, high-tech concert performances. Dunn’s electrifying singing and Brooks’ exuberant showmanship packed arenas. “Little Miss Honky Tonk” and “You’re Gonna Miss Me When I’m Gone” both hit No. 1 in 1995. The 1996 smash “My Maria” became the biggest country hit of the year and earned the team a second Grammy. Brooks & Dunn capped 1996 with the CMA Entertainer of the Year honor. Hits such as “A Man This Lonely” (1997), the Reba McEntire collaboration “If You See Him” (1998), “How Long Gone” (1998) and “Husbands and Wives” (1998) buoyed the duo to the end of the decade. In 2001, “Ain’t Nothing ‘Bout You” became the year’s biggest country single. “Only in America,” co-written by Brooks, has been used extensively in presidential campaigns for both parties. Brooks & Dunn leaped back to the top of the charts with “Red Dirt Road” and “You Can’t Take the Honky Tonk Out of the Girl” in 2003. Dunn’s co-written “Play Something Country” and “Believe” became iconic singles of 2005, with the latter winning CMA Single and Music Video of the Year awards. The duo reunited with McEntire on 2008’s “Cowgirls Don’t Cry.” Brooks & Dunn have also collaborated on recordings with such artists as Asleep at the Wheel, Johnny Cash, Billy Gibbons and Mac Powell. In 2006, Brooks became the host of the nationally syndicated radio show American Country Countdown, having taken home CMA and ACM awards for his hosting duties. As a CMA board member and Chairman of the Board in 2005, he was pivotal in the creation of its “Keep the Music Playing” program benefiting music education, which has become the CMA Foundation. He was also the first recipient of the CMA Humanitarian Award in 2015. Brooks & Dunn earned a star on the Hollywood Walk of Fame in 2008. The duo announced their retirement in 2010, with a final performance benefiting the Country Music Hall of Fame, before reuniting in 2015. Dunn was inducted into the Nashville Songwriters Hall of Fame in 2018. He also launched his own photography venture known as the “Lensman Project,” offering fans a look into his passion for capturing special moments, with his work being featured in Cowboys & Indians Magazine as well as being exhibited at Cheyenne Frontier Days. In 2014, the duo announced their reunion along with long-time friend, McEntire, for a residency called “Together in Vegas” at The Colosseum at Caesar’s Palace in Las Vegas, which received rave reviews and continues to be extended with more shows throughout this year. Brooks & Dunn recently announced their upcoming collaboration album Reboot. Available on April 5, the 12-track release will see the duo team up with Kane Brown, Thomas Rhett, Brett Young, LANCO, Ashley McBryde, Brothers Osborne, Luke Combs, Midland, Cody Johnson, Jon Pardi, Tyler Booth and Kacey Musgraves on re-ignited versions of Brooks & Dunn’s biggest hits. 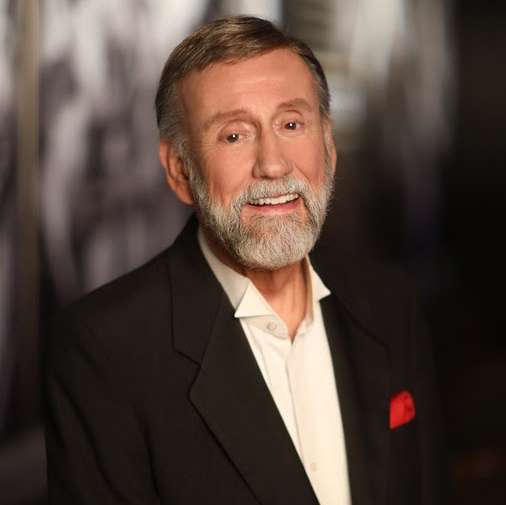 Having one of the most multifaceted careers in entertainment has led Ray Stevens to the Country Music Hall of Fame. During his six decades in the music business, he has been a session musician, a TV celebrity, a song publisher, a singer, a record producer, a real-estate magnate, a label owner, a nightclub entrepreneur, a music arranger, a video director, a studio builder, a pop-music hit maker, a comic, a gospel artist and a country star. 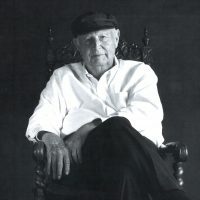 Stevens is renowned for recording novelties like “The Streak” as well as serious fare such as “Everything Is Beautiful.” He was elected to the Nashville Songwriters Hall of Fame in 1980. Born Harold Ray Ragsdale in Georgia in 1939, Stevens was a piano player from the age of seven. He grew up in Albany, Georgia, where he formed his first band and became a teenage disc jockey. When he was 17, the family moved to Atlanta. He met his music mentor there, publisher/entrepreneur Bill Lowery. The mogul took him to Nashville to record and arranged a contract with Capitol Records. The company issued his self-composed teen tune “Silver Bracelet” with his “Ray Stevens” stage name in 1957. Stevens majored in music in college. But he truly received his education from Lowery, as did his peers Bill Anderson, Mac Davis, Jerry Reed and Joe South. He worked as an instrumentalist, backup vocalist and producer on recording sessions for Lowery, in addition to making his own records. He first appeared in the pop hit parade in 1960 with his novelty ditty “Sergeant Preston of the Yukon,” issued on Lowery’s NRC label. Stevens next signed with Mercury Records. He moved to Nashville in early 1962 and hit the ground running as a session musician on Leroy Van Dyke’s “Walk on By” and Joe Dowell’s “Wooden Heart.” Those hits were recorded on the same day. So was his own comedic smash “Ahab the Arab,” which exploded on the pop charts later that year. He continued to record humorous, self-composed songs for Mercury for the next five years. He also continued to work as a Music Row session musician. Stevens backed Brook Benton, Ronnie Dove, Brenda Lee, Patti Page, Elvis Presley, Charlie Rich, B.J. Thomas and hundreds of others. He began his stint on Monument Records in 1968 with serious material such as “Unwind” and the socially conscious “Mr. Businessman.” Stevens also produced some of Dolly Parton’s early recordings for the label. He roared back into the pop Top 10 with 1969’s wacky “Gitarzan,” but later that year introduced Kris Kristofferson’s somber “Sunday Mornin’ Comin’ Down.” The latter song marked Stevens’ debut on the country charts. When pop superstar Andy Williams went on hiatus from his network television show in the summer of 1970, Stevens was tapped to host a temporary replacement variety series. For its theme song, Stevens wrote “Everything is Beautiful.” Released on Williams’ Barnaby label, “Everything is Beautiful” became a No. 1 pop smash. It also earned Stevens his first Grammy. The song has since been recorded by more than 100 other artists. In 1971, Stevens scored his first Top 20 country hit with the gospel standard “Turn Your Radio On.” “Bridget the Midget” became a massive British hit in that year as well. His recording of “Love Lifted Me” earned him a gospel Grammy nomination. In the early 1970s, Stevens invested in Nashville real estate, built his Music Row studio/office complex and formed his own publishing company. Staff songwriters included Layng Martine, Jr. (Presley’s “Way Down,” Billy Crash Craddock’s “Rub It In”), Mark Petersen (Sammy Kershaw’s “Cadillac Style” and “I Can’t Reach Her Anymore”) and Buddy Kalb (Chet Atkins’ “Frog Kissin’” and many Stevens singles). Released in 1974, “The Streak” topped both pop and country hit parades and became a five-million-selling phenomenon. The following year, Stevens created an ear-tickling, bluegrass-jazz arrangement of the Johnny Mathis pop standard “Misty.” It became his biggest country hit and earned him his second Grammy. His innovative skills as an arranger were also in evidence on a doo-wop version of the operetta oldie “Indian Love Call” (1975) and a treatment of the Glenn Miller swing classic “In the Mood” (1977) done in clucking chicken voices (billed as Henhouse Five Plus Too). He continued to mix comic and serious songs during stints with Warner Bros. and RCA. But when he signed with MCA Records’ country division in 1984, it was as a comedy act. Stevens emphasized his funny forte in the 1980s with such country hits as his self-composed “Shriner’s Convention” (1980) and the Kalb-penned “Mississippi Squirrel Revival” (1985). “I Need Your Help Barry Manilow” and “Would Jesus Wear a Rolex” earned him comedy Grammy nominations in 1980 and 1988, respectively. The fan-voted Music City News Awards named Stevens its Country Comedian of the Year for nine consecutive years, from 1986 to 1994. His humorous efforts for MCA earned him a string of Gold and Platinum albums. He repeated these feats during a stint at Curb Records. In 1991, Stevens opened his own theater in Branson, Missouri. During the next three seasons, he performed for more than a million fans there. At the venue, he noted audience enthusiasm for his humor videos. His 1992 compilation Comedy Video Classics became a 10-times Platinum home video. This led to a series of similar DVD projects, several of which became million sellers. He marketed both video and music efforts on his own Clyde label in the new millennium. In 2012, he issued the giant, 108-track box set Encyclopedia of Recorded Comedy Music. He published his autobiography, Ray Stevens Nashville, in 2014. The following year, he launched his own television series on RFD-TV and then Public Television. In 2018, Stevens opened CabaRay Showroom. This 700-seat dinner theater is Nashville’s most sophisticated and technologically advanced showroom. Today, Stevens is regarded as the most successful comedy recording artist of all time.